Josh Sage won the Stookey Memorial at Shady Bowl on Saturday, dominating the race for the victory. 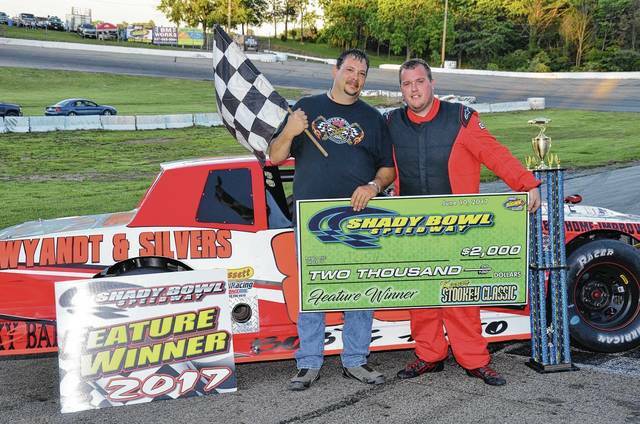 DeGRAFF – The 62-lap Ken Stookey Memorial Classic topped a night of speed at Shady Bowl Speedway on Saturday. The 62-lap street stock feature paid $2,000 to win. A field of 20 street stocks took the green to start the feature. Rodney Roush led the first four circuits before giving way to Piqua’s Josh Sage. Sage quickly showed he was the man to beat in his Wyandt and Silvers backed racer. Sage was so dominant that when the race was over there were only three cars on the lead lap. The win was the first of the season for the veteran driver. Roush held on for second, with Rob Schaeff third, Nic Burnside fourth and Chad Small II fifth. Jacob Muncy was fast qualifier. The Ohlinger Automotive Hard Charger Award went to Chester Frazier. In late model action Dayton’s Don Mahaffey Jr. and former track champion Matthew Parsons battled all the way to the checkered before finishing in that order. Mahaffey, behind the wheel of his Hanger 18 Race Cars racer, also was fast qualifier. Kenny George Jr, Caleb Reschar and Jim Lewis Jr. finished third through​ fifth in the 35-lapper. George won the dash, with Reschar carrying the checkered for the heat race. The Amsoil Hard Charger Award ended in a tie as Mahaffey and Lewis shared the award. The 30-lap modified feature saw Mike Pippin lead the first two counters before giving way to Jason Burnside. On lap 13 Springfield’s Shane Shirk took over the point. Shirk led the rest of the way in his Maplewood Tree Service sponsored open wheeler. Greg Stapleton was second, with Brian Brandyberry third, Logan McPherson fourth and Buddy Townsend fifth. Shirk was fast qualifier and also won the DeGraff Service Center Hard Charger Award. Brandyberry took the dash, with heats going to Chris Prater and Jerry Stapleton. The pure stock 10-lap feature went to New Carlisle driver Zack Doolin. Doolin, sponsored by Whiteline Designs, has been the man to beat as he has dominated the class. John Eastman, Ryan Tamburro, Jason Purtee and Rob Bryant filled out the top five. Purtee was fast qualifier. In compact racing, Josh Foltz picked up his fourth feature win of the season. The New Carlisle driver was behind the wheel of his RamRod Motorsports Neon. Cody Wynn was second, with Corey Kyer third, Mike Wintrow fourth and Larry Adams fifth. Foltz picked up the Quick Parts Hard Charger Award. Bob Brown was the winner of the spectator drag race, with Chad Owens second. On Saturday, Shady Bowl will host the annual Bobby Korn Memorial for the late models. Korn was a local car builder who had cars that ran all over the country from Daytona to Shady Bowl. The 72-lap feature will pay $1,720 to win. The modifieds, street stocks, pure stocks, compacts and spectator drag races are also scheduled. Racing will begin at 7 p.m.
https://www.urbanacitizen.com/wp-content/uploads/sites/36/2017/06/web1_presssage20176111989766.jpgJosh Sage won the Stookey Memorial at Shady Bowl on Saturday, dominating the race for the victory.